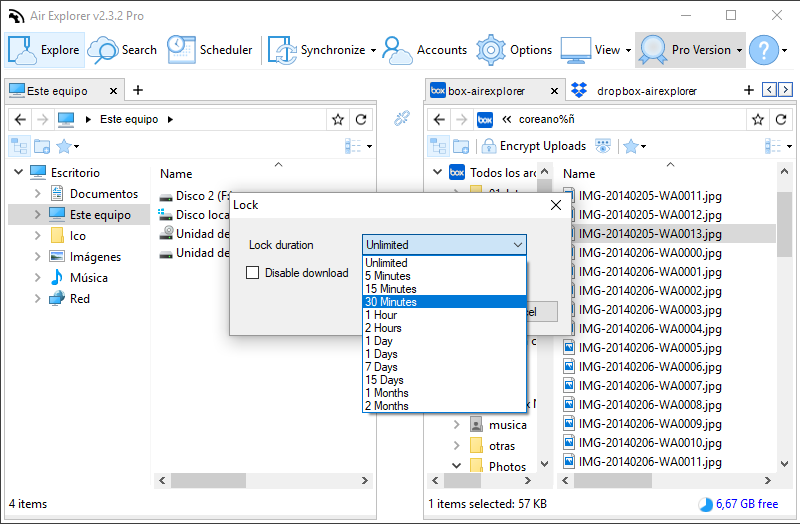 -New option in synchronizations to compare only files newer than a period. 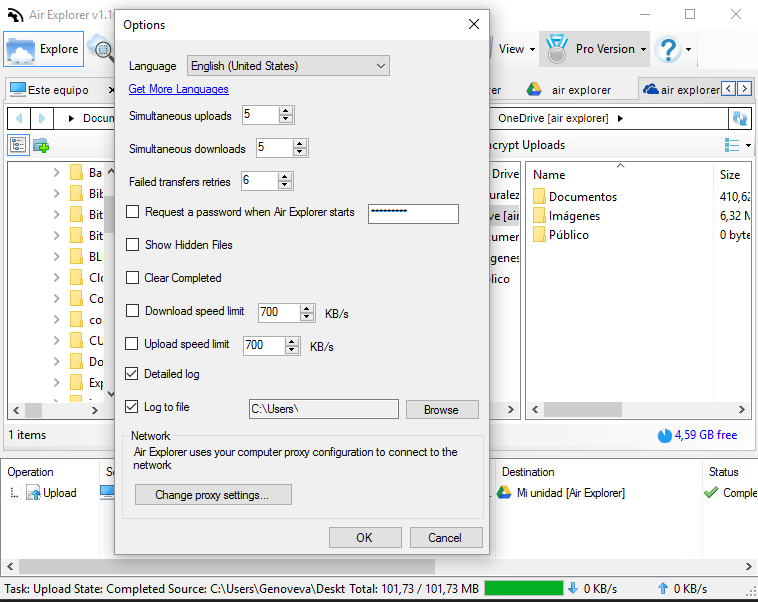 –Added a bandwidth scheduler, now it is possible to schedule the upload and download bandwidth limits depending on the day and hour. -Added an option to execute a command or connect a network drive before a scheduled task is executed. -Fixed, the duration value in the synchronization report was sometimes wrong. -Synchronization filter now supports many more rules. -Updated Hungarian translation (thanks to SEDATIVE). -Updated Brazilian Portuguese translation (Thanks to Igor). 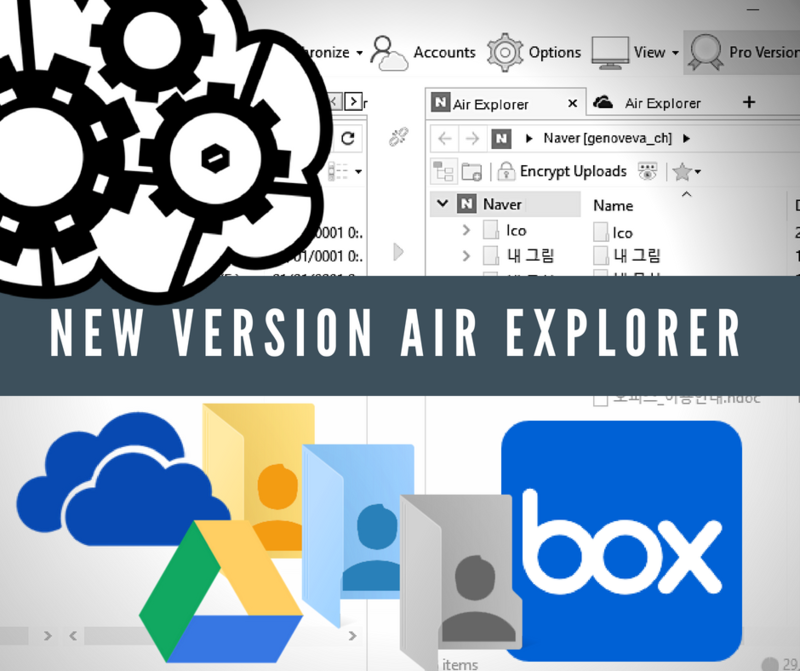 Air Explorer has included some of the Box utilities as the lock function, the collaborators and the metadata features. Use the lock function is very easy in Air Explorer. When you select a file and have clicked to lock it, a window opens to ask you how long you want to have it blocked. Then the file will be blocked during the selected time and nobody will be able to modify it until the set time has finished. 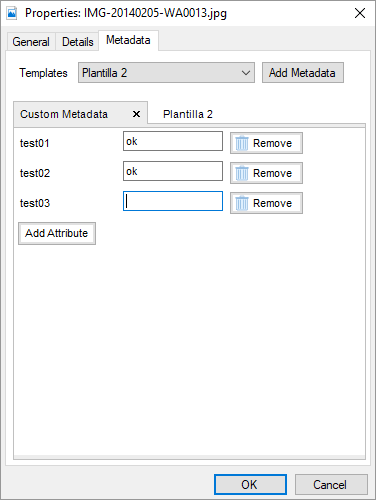 Metadata allows users and applications to define and store custom data associated with their files in Box. 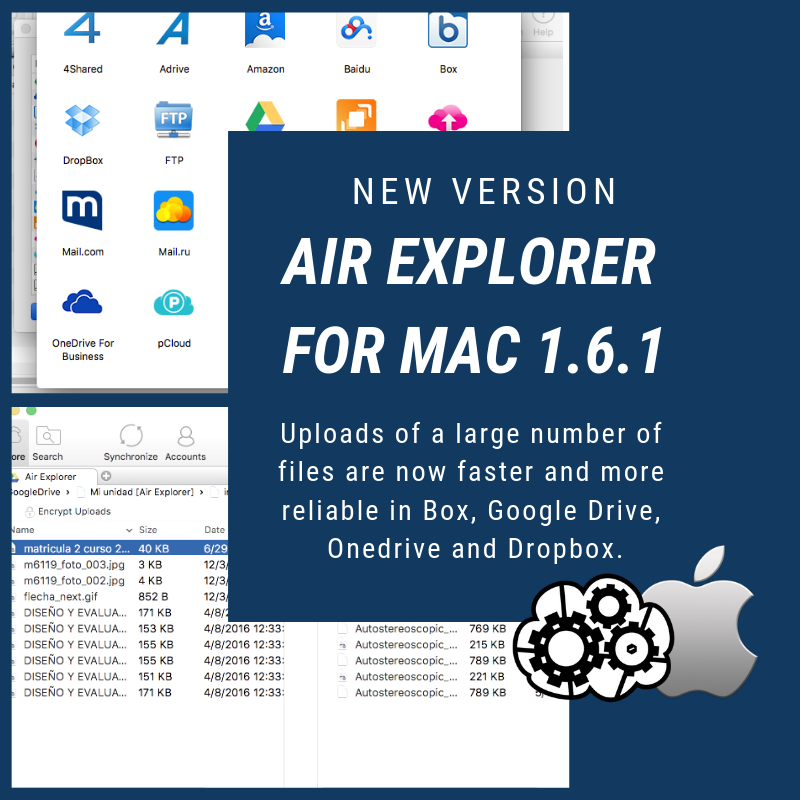 With Air Explorer, you can manage the metadata very easily. Select the file you want to add or modify the metadata an click right botton and click metadata. 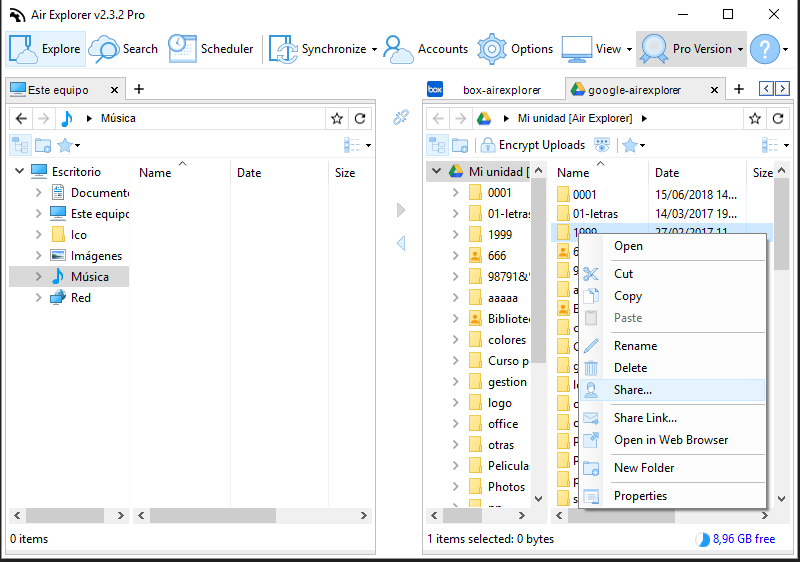 Then, a window opens and here you can manage the metadata of this file. The collaborators for Box works like share folder in Google Drive, OneDrive and OneDrive for Business. But, in Box, it has some peculiarities. The first is that in the others clouds, the name in Air Explorer is “Share” and for Box, the name is “Collaborators”. Collaborators Box folders are shown in grey or blue like in the Box web. -Fixed problem with OneDrive for Business accounts. -Some Google Team Drives were not displayed. -Fixed, in certain cases although all the sync tasks were done correctly Air Explorer reported that some tasks failed. -Shared Box folders are shown now in grey or blue like in the Box web. -Shared folders for Dropbox, Google Drive, OneDrive and OneDrive for Business now have a different icon. 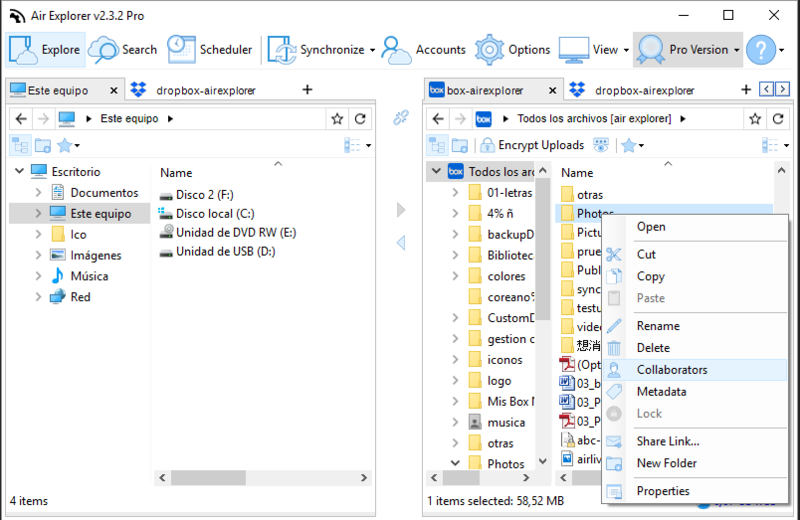 -Added Share folder support for DropBox. -Added Share folder support for Google Drive. 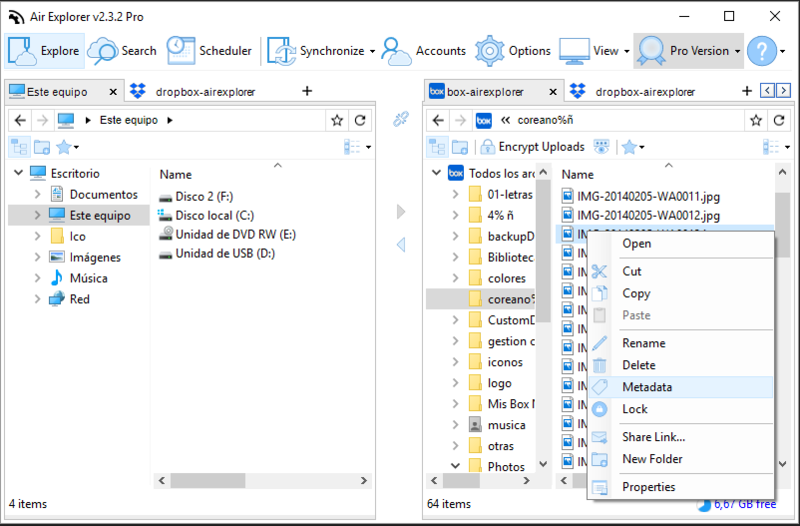 -Added Share folder support for OneDrive for Business. -File lock function for Box. -Command line client: Fixed, some log lines could be written in the command line output instead of in the log file. -Command line client: Fixed error closing the log file. -Command line client: now the console output (stdout) supports UTF-8 encoding, anyway the parameter /logfile is still recommended over stdout redirector. -Fixed rare error refreshing a folder. -Support for long paths in Windows 10. Long paths must be enabled in Windows. 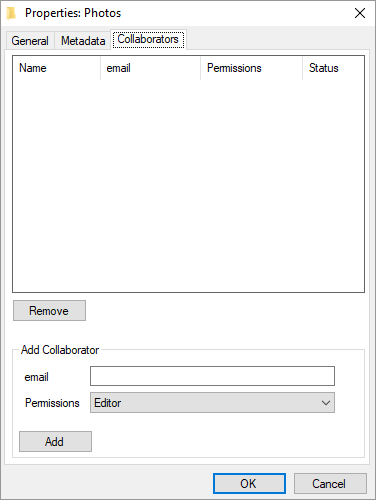 -Option to enable or disable chunked uploads in Box. -Added support for Google Team Drives. 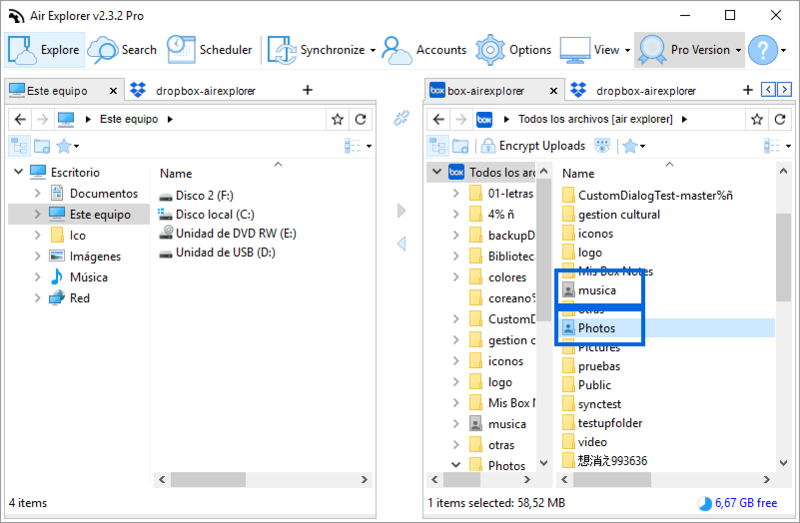 -Don’t trasnfer hidden files when folders are copied if view hidden files option is disabled. -Show progress after changing synchronization options. -Retry create folder operations in sychronizations. -Show error information in the logs when a local foder can not be accessed. -Retry when there is a 502 error on Box. -Retry when there is a timeout error on Box. -Fixed, when browsing a mounted network drive the address bar does not work. -Reorder accounts in the Accounts Window with drag and drop. -Do not refresh the accounts list when moving accounts up or down in the Accouns Window. -Updated Rusian translation (thanks to Timofey). 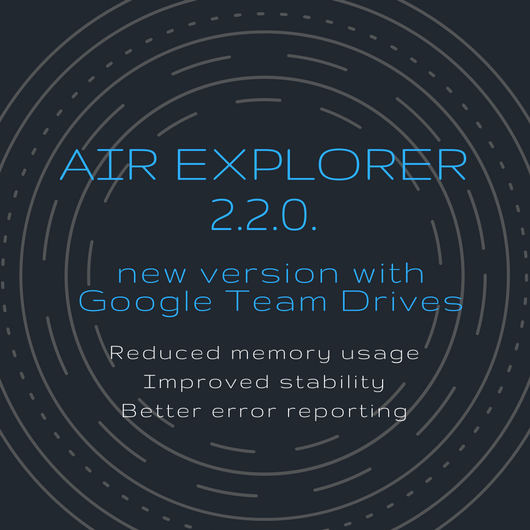 -Air Explorer uses the system proxy configuartion. 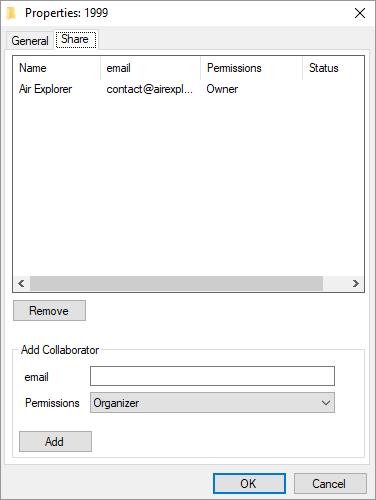 -Added an option to change the proxy settings from Air Explorer options. -The local network can be browsed and synchronized with any cloud using Air Explorer. -Added option to log to a file (Pro version only). -Added option to export logs (Pro version only). -Added button to cancel the current search. 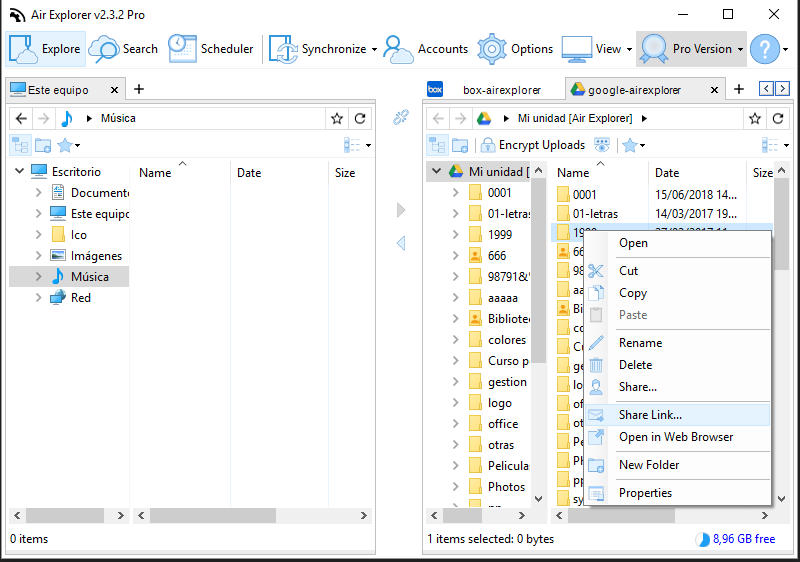 -Removed limit of files per folder in Box.com. -Show synchronization configuration window before starting the comparision. -Fixed cancelling upload or download folders were not cancelled correctly. -Improved performance working with folders with a big number of files. 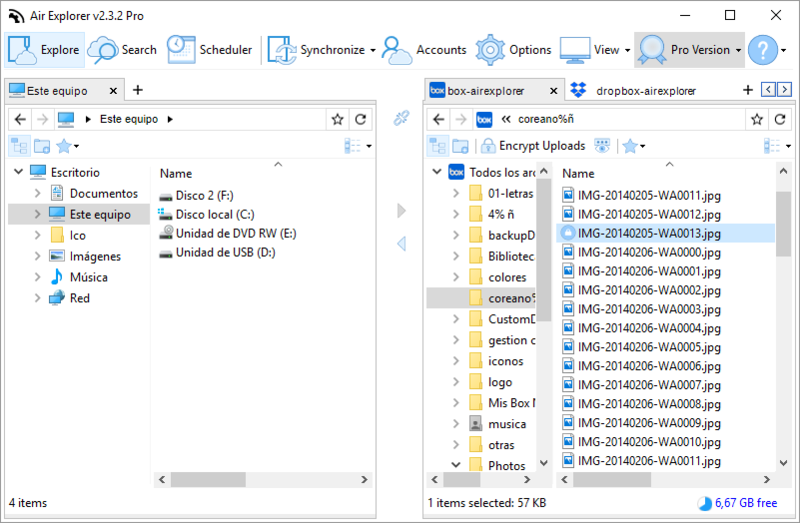 -Fixed transfer big files from one cloud to Google Drive. 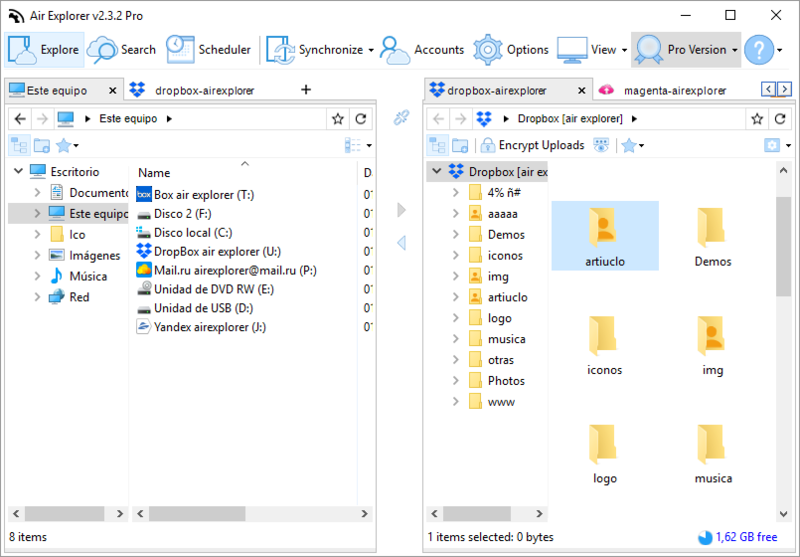 -Added more information while a creating folders structure when uploading entire folders. -Fixed error uploading small files to Mediafire. -Fixed trasnfer files from one cloud to Amazon sometimes the files were not refreshed. -Fixed do not allow to copy folder into subfolder. -Fixed quota and available space were not displayed correctly in Yandex and some Webdav servers. 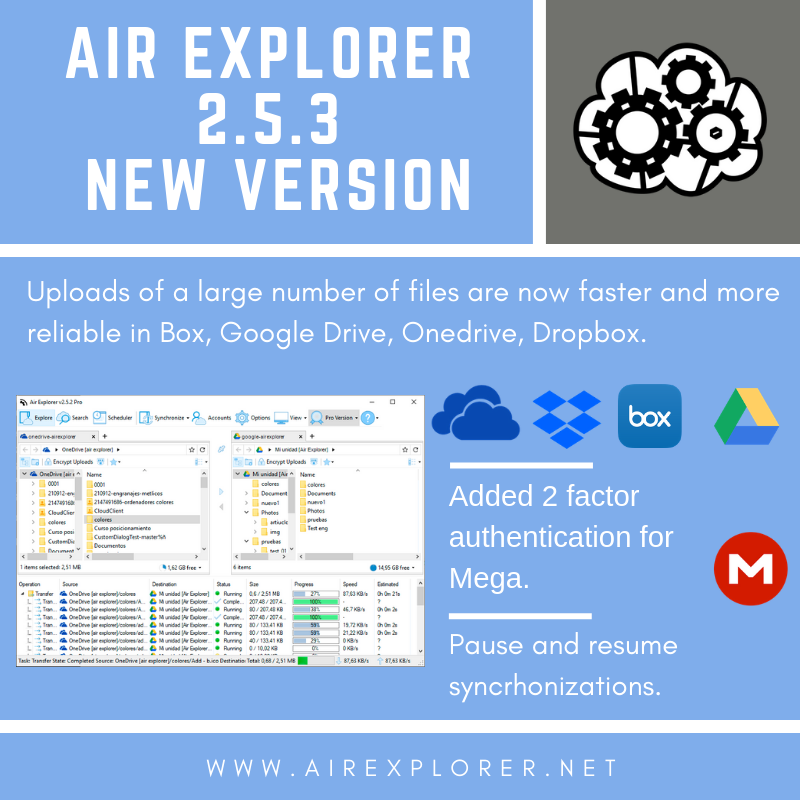 -Show information when Air Explorer is hashing a file to compare it with another file. -The conflict dialog box now is always on top and has better looking. -Fixed when exit was cancelled the task list was not refreshed anymore. -Fixed sometimes the tasks list was not refreshed when several Air Explorer windows were opened. -Fixed wrong download progress reported for some Google Drive files. -Files names are not truncated in list mode. 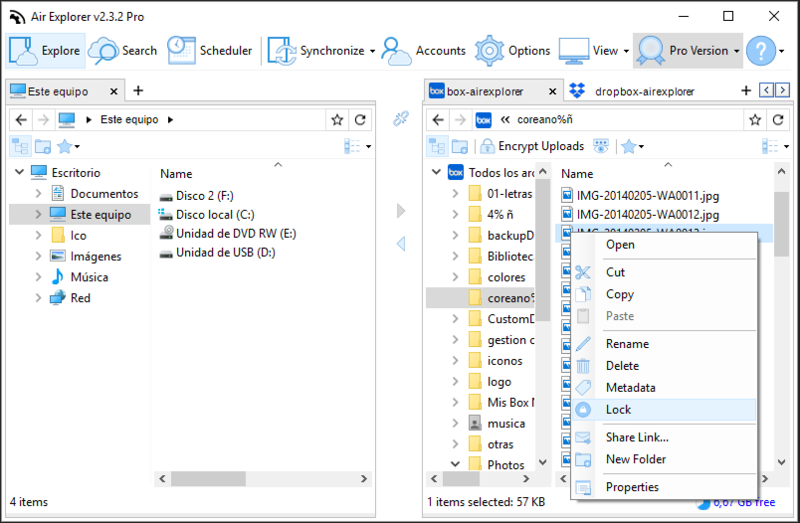 -Fixed transfer big files from one cloud to Onedrive.